Google posted data about helping the victims of tropical storm Ketsana. 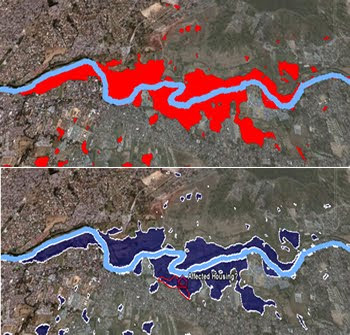 This is great work, letting people see the problem in geographical context soon after the event. Blue better for Water: However, I think the choice of colors used could be improved. They have used bright red to illustrate the flooded areas. While this attracts the eye to all the small areas its too intense for the large areas it covers. In addition, red doesn't work well to mark water cover, my first impression is that its a river of blood. Much better to choose a shade of blue and to make it translucent so you can see roughly what lies below it. To make the areas more noticeable I've outlined then in white. My version as a .kmz. Annotation Adds Value: In looking at the data I noticed that most of the flooded areas are actually fields on free areas. Not much obvious housing seems to have been flooded. I've added a polygon which I've outlined in red and a placemark to show its location, double clicking the placemark will take you to the area of interest where there has been some housing flooded. This sort of annotation adds value to the data and encourages people to explore more for themselves IMHO.